About Trish Voice Teacher, Vocal Therapist, vocal coach. Trish grew up listening to all styles of music. At the age of 10, her favorite Country artists were Ray Charles, Roger Miller & Johnny Cash. Her sister played a lot of R&B & "Motown," especially artists like The Four Tops, The Temptations, Smoky Robinson & Steve Wonder, who influenced her in Soul Music and The Blues. Trish began learning guitar chords and a few melody lines and she started to accompany herself learning folk songs of Bob Dylan, Van Morrison, Leonard Cohen, Joni Mitchell, Linda Ronstadt & Laura Nyro. Her mother had a satiny Sarah Vaughan style contralto voice and from her she learned concepts like phrasing, timing and improvisation. Her grandmother sang and played the piano and organ by ear and was inspired by Peggy Lee, Connie Francis and Ray Charles. By listening to her grandmother, she began to simulate some voicings she heard in the music. Moving to the West Coast in the latter 80's introduced Trish to "KJAZ" which was at the time, the premier San Francisco Jazz station. Listening to jazz was extraordinarily challenging and very compelling and the most musically inspiring to date. Her brother, began making audio cassettes for her of compilations of the history of jazz, which included many instrumental groups and vocalists. Trish tuned into the local SF jazz scene and she began attending Bay Area jam sessions and shows at Yoshi's Jazz House and Bluesville, an Oakland, CA and other music venues around SF Bay Area. Trish took beginning piano and jazz appreciation at Santa Rosa Junior College and attended Jazz Camp West, where she met and worked with jazz musicians and teachers Bennett Friedman, Jay Clayton, Rhiannon, Rufus Reid and Faith Winthrop. She took courses at the Jazz School Conservatory in Berkeley, CA and studied improvisation with famed Jazz Guitarist, Mimi Fox and studied Speech Level Singing technique with Dave Stroud. Trish began teaching a few private students in 1998 at her home studio in Santa Rosa, CA. Later she taught at local music stores in the North San Francisco Bay area. In 2000, she formed the Jazz Vocal Forum which is a repertoire practice group where singers rehearse new material and offer and receive support and feedback and work with live piano accompaniment. In 1999 Trish opened Jazz Jam Cafe' an intimate concert room that featured the music of local San Francisco Bay Area Jazz Artists live in concert and sold CD's of their music. 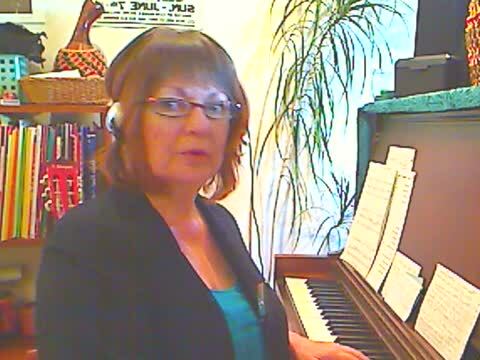 FOR ON-LINE VOICE LESSONS YOU WILL NEED TO WORK OVER SKYPE. CLICK HERE TO DOWNLOAD SKYPE. IT'S FREE - A PAID SKYPE ACCOUNT ISN'T NECESSARY.